But it was another great weekend of meeting fellow makers and creatives from around the UK and the world. With my fellow local makers, I was on the Maker Space stand with various great projects on display. Ed’s 1D Pong, my R-Kade, Jon’s Over Eng’d, Iain, Tommy and Alistair’s Christmas window (I know we’re into April), Glen’s 3D Printer and EggBot, Chris B’s LED cubes, Chris D’ custom retro console, Rosie with her sewing. Meeting up [again :-)] with Aaron from Oomlout was there again. Likewise meeting up with Mitch Altman of TV-B-Gone fame and co-founder of Noisebridge was there again. and meeting a great number of other makers from the UK, Europe and rest of the world was great was well. 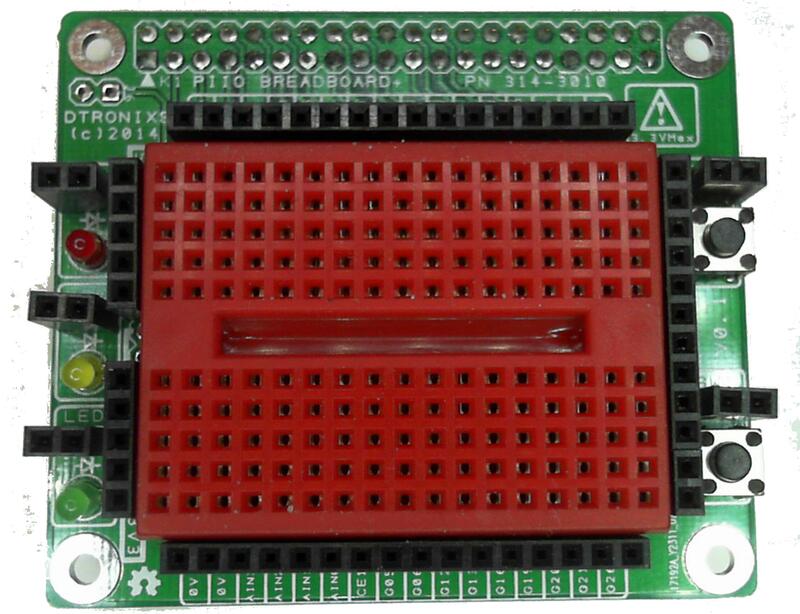 RPi Breadboard+ is a solderless prototyping breadboard add-on for the Raspberry Pi. Using the breadboard and female to female wires you can quickly prototype and test your electronic design. A large portion of the add-on is taken up by a 140-pin breadboard and surrounding the breadboard on all four sides are a number female headers. All of the Raspberry Pi GPIO signals are brought out to two 16-pin female headers located near the top and bottom of the breadboard. 3.3V (5-pin), 5V (5-pin) and 0V/Ground (12-pin) power supplies are also brought out to female headers located to the sides of the breadboard. The add-on features 3x LED’s (red, yellow and green) and 2x push-button tactile switches each having a 2-pin female header for easy use with the rest of the board. Size wise it conforms to a standard HAT board size (65 x 56mm) and mounting holes. So its compatible with the Raspberry Pi A+, B+ and Pi2. There is an EEPROM PCB footprint for future HAT configuration compatibly but its not fitted on this version. You can find them on Tindie here. You are currently browsing the Zuzebox's Blog blog archives for April, 2015.